Special-edition model celebrates ten years of the Touareg. It&apos;s been ten years since the original Volkswagen Touareg premiered at the Paris Motor Show, and to mark a decade of success, VW has rolled out a new special model. The Touareg Edition X comes loaded with exclusive cosmetic features. 19-inch alloys complement the optional Moonlight Blue Pearl Effect body paint. A panoramic sunroof, silver anodized roof rails, bi-xenon headlights, LED daytime running lights and darkened rear light clusters further distinguish the special edition. A Chrome & Style designer pack, tinted side and rear windows and Touareg X logos on the wings round out the package. The special edition&apos;s interior is upholstered in amber brown Nappa leather boasting a new style of braid-embossed finish. Real ebony inlays adorn the doors and instrument panels, and illuminated front door sills come with Touareg X lettering. Completing the cabin is color-matching stitching on the leather steering wheel, gear lever and floor mats. 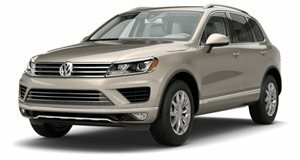 Available now, the Touareg X starts at 61,025 Euros for the 204-horsepower V6 TDI with 8-speed automatic transmission.